Let the experts at Doc’s Discount Pool Tile Cleaning remove the calcium build up from your Pool Tile, Pebble Tec, Rocks, Water Features and More!!!!! Your swimming pool is one of your biggest investment and requires regular maintenance, care and cleaning. As time goes on hard white calcium deposits line the walls of your pool tile, Pebble Tec, rocks, and water features. Cleaning your pool tile is a tedious process and trying to clean pebble tec or rocks is nearly impossible to do by yourself. Plus, pumice stones damage tile. I know it says on the package will not damage tile, but it does. Doc’s Discount Pool Tile Cleaning is dedicated to making your pool tile and Pebble Tec look it’s best. Unlike many of our competitors, we only do calcium removal. All of our equipment is customized and specifically designed to clean calcium safely, effectively, affordable and eco-friendly. Don’t waste another minute with scrub brushes, razor blades, chemicals that don’t work, pumice stones or the dreaded hammer and chisel. Save your weekends for you and your family and let us do your dirty work. Doc’s Discount Pool Tile Cleaning is proud to serve Tucson, Oro Valley, Marana, Vail, Sauharita, Green Valley, Tubac, Rio Rico and Casa Grande. 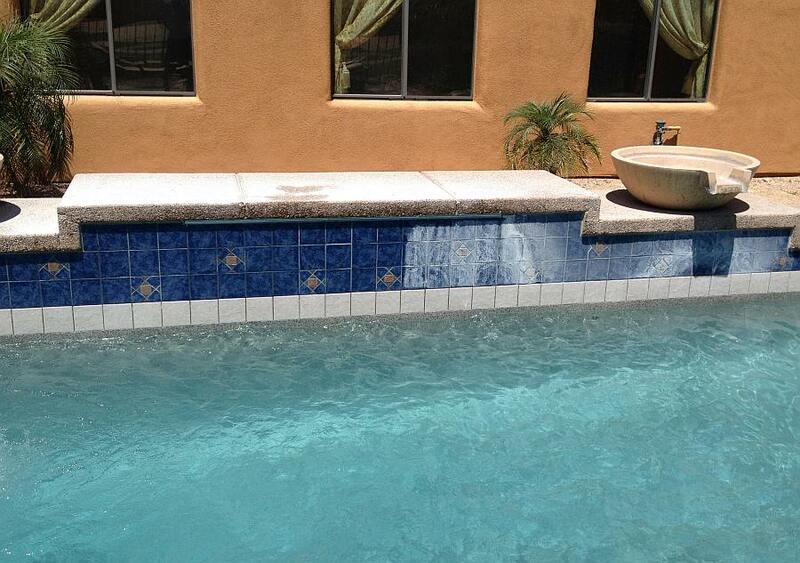 pool tile cleaning in Tucson. Quite simple, because we are the best. We have the best customized equipment the marketplace has to offer. Doc’s has spent the time and money researching and testing the best equipment to make sure we deliver exceptional results. WE NEVER USE PRESSURE WASHERS OR GLASS BEAD TO CLEAN TILE. Pressure washers blast at 4,500 PSI and can gouge out grout lines and blow out tiles damaging your pool and costing you more money in repairs. Our customized tile cleaning equipment delivers media at a gentle 40 to 80 PSI. Pool tile cleaning involves getting rid of the calcium deposits (which are ROCK) from the tiles of the pool, and this task is very challenging and needs to be done by trained and skilled professionals that have the right equipment. You can rely on Doc’s Tucson Pool Tile Cleaning methods, so the calcium deposits are removed without any harm to the tiles. The Professionals at Doc’s have the expertise and skills for providing the best pool tile cleaning service. Doc’s Discount Pool Tile Cleaning has the best way of removing your pool calcium at an affordable price.